The String Ensemble is a beginning/intermediate level group for students who have had 1-2 years of experience playing a string instrument. String Ensemble members receive both sectional and full ensemble rehearsals. In addition to the development of basic instrumental music foundations, instruction focuses on the finer details of playing in an ensemble. Students in the String Ensemble receive instruction on music theory and learn scales to improve technique and expand range. The sectional rehearsals offer the opportunity for the students to learn and perform chamber music or small ensemble pieces. The minimum age for taking part in this ensemble is 7 years, although the director would consider younger students depending on the outcome of a formal assessment. The String Orchestra is an advanced level group comprised of students who have had 3+ years of experience playing a string instrument or have demonstrated a high level of proficiency on their instrument. String Orchestra members receive both sectional and full ensemble rehearsals. 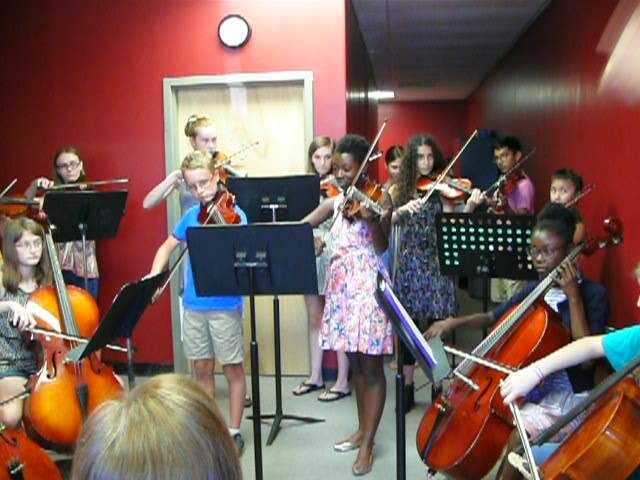 Students in the String Orchestra rehearse and perform high quality music in many styles and genres. In rehearsals, instruction is focused on balance, blend, intonation, dynamics, articulation, phrasing, and accuracy of pitch and rhythm. Students learn major scales and minor scales and music theory concepts. The sectional rehearsals offer the opportunity for the students to learn and perform chamber music or small ensemble pieces. The minimum age for taking part in this ensemble is 7 years, although the director would consider younger students depending on the outcome of a formal assessment.